In order for us to understand why batteries fail, unfortunately a little bit of chemistry is needed. 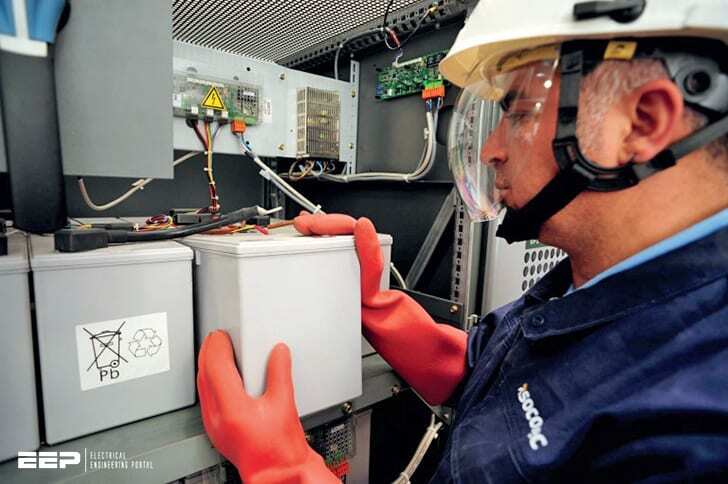 There are two main battery chemistries used today: lead-acid and nickel-cadmium. Other chemistries are coming, like lithium, which is prevalent in portable battery systems, but not stationary, yet. Volta invented the primary (non-rechargeable) battery in 1800. Planté invented the lead-acid battery in 1859 and in 1881 Faure first pasted lead-acid plates. With refinements over the decades, it has become a critically important back-up power source. The refinements include improved alloys, grid designs, jar and cover materials and improved jar-to-cover and post seals. Arguably, the most revolutionary development was the valve-regulated development. Many similar improvements in nickel-cadmium chemistry have been developed over the years. posts that are also connected to the top connections of the like-polarity plates. All batteries have one more negative plate than positive plate. That is because the positive plate is the working plate and if there isn’t a negative plate on the outside of the last positive plate, the whole outer side of last positive plate will not have anything with which to react and create electricity. Hence, there is always an odd number of plates in a battery, e.g., a 100A33 battery is comprised of 33 plates with 16 positive plates and 17 negative plates. In this example, each positive plate is rated at 100 Ah. Multiply 16 by 100 and the capacity at the 8-hour rate is found, namely, 1600 Ah. Europe uses a little different calculation than the US standards. 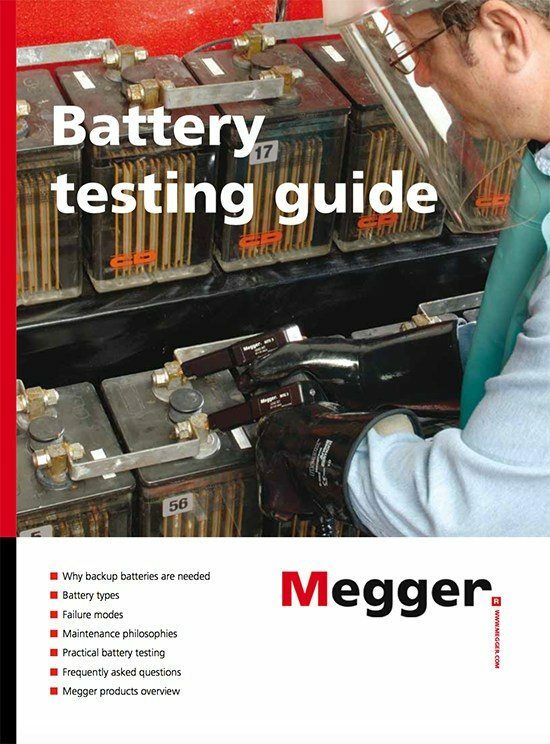 In batteries that have higher capacities, there are frequently four or six posts. This is to avoid overheating of the current-carrying components of the battery during high current draws or lengthy discharges. A lead-acid battery is a series of plates connected to top lead connected to posts. 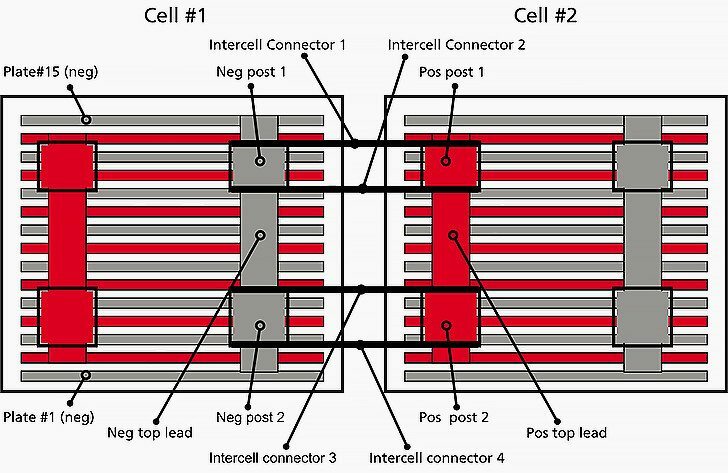 If the top lead, posts and intercell connectors are not suffciently large enough to safely carry the electrons, then overheating may occur (i2R heating) and damage the battery or in the worst cases, damage installed electronics due to smoke or re. To prevent plates from touching each other and shorting the battery, there is a separator between each of the plates. Figure 1 is a diagram of a four-post battery from the top looking through the cover. It does not show the separators.